the Online Writer - What do YOU have to say? Click on Book Titles to view Contents! Note the addition of the "BLOGS" volume? NOW you can search the entire Online Writer site to find Poems, people, topics, etc. Use the lightning-fast FreeFind Search engine. 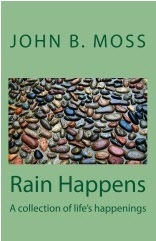 Rain Happens - by John B. Moss Care to donate? Peace doesn't just happen - it is sought out, negotiated, and can never be trusted to remain. Won't you help to keep it?